A New Mac Tip Every Day: Sharing a keyboard and mouse on two computers! Sharing a keyboard and mouse on two computers! I think this is one of the most awesome and useful tip ever. It is all about a free open-source application called Synergy. What it does is it lets you share your keyboard and mouse between two or more computers. So when you get to an edge of a screen, it automatically switches to the edge of your other computer screen. The best is it works with all Mac, Windows and Linux computers, as long as they are networked. So even if you have a Mac and a PC, you can share your keyboard and mouse. It also offers a lot more than just keyboard and mouse sharing, it also shares the clipboard so you can copy on one computer and paste on the other one. I have to say, it is not easy to install on the Mac because there is no graphical interface. I won't rewrite all the installation steps, because Synergy has them all on their website, but I will add some info where I had problems. This is a link to the developer's website where you can find the downloads and the installation instructions. 1. The download will leave you with a folder. You can copy it anywhere on your system. I copied it to the applications folder. You also have to copy it to every other computer that will be sharing the keyboard and mouse. 3. In the "section: screens", replace "moe", "larry" and "curly" with the name of your computers. These names can be found in System Preferences, Sharing. Right under the computer name text box, it is written the name of your computer in this format: "computername.local". 4. 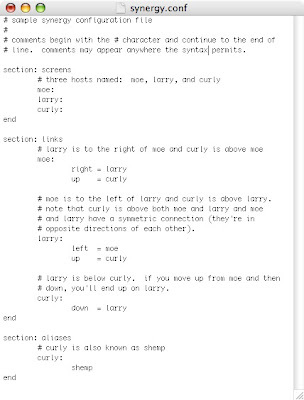 Replace "moe", "larry" and "curly" all through the text file. In my experience, you don't need the aliases section, I just deleted it. 5. Make sure the right, left, up or down is assigned correctly in the links section. This will decide whether you change monitor on the left, right, up or down edge of your monitor. 6. Once this is all done, you are ready to open everything. 7. On the server (the main computer will be the server), open Terminal (located in Applications/Utilities). 11. Hit "Enter". It should start running. You are now ready to launch the client (the secondary computer). 13. Add "-f server-host-name", replacing "server-host-name" with the name of the server computer. 15. That's it. The connection should be established and you should be able to move your mouse (the server mouse) from one computer to the other. Copy/Paste should also work. There is a lot more info on the developer's website about how not to have the Terminal window running all the time and how to install it in a multi-OS configuration. Woody: Teleport looks very interesting, but from what I understand it only works with multiple Macs, not multiple different OS. I think both teleport and synergy are great. Wow, that looks amazing! Would save me a lot of time since I use my MacBook and my PC keyboard on the same space! Awesome. I gonna check it later, looks like a bit hard to set. Synergy has been making life easier for me for the past two years. Don't let the terminal scare you and the setup really isn't very bad. One helpful hint is to set the corner option if your corner are hotspots for expose, etc. I use the following in the conf . . . I just have to say thanks. No need for any KVM switches now, and it works with my wireless mice, great tip! Once I will bring in my "new" powermac, that will become my favourite app!! One of the best tip ever writed here! Maybe I'll check out QuickSynergy.. I have a Mac G4 desktop running OSX 10.4.10 and a Windows box running 2000. I use one monitor and have a KVM switch - however the switch only has ports of the monitor, not the keyboard and mouse. Is there a program that works between a Mac and a PC with only one monitor? Just to reinforce danny, there's a mac version WITH an interface, and easy to install and use called "quicksynergy". Recomended! Check out http://software.landryhetu.com/synergy/ This has more features than QuickSynergy and also was the only version that I got to work using my iMac as the server. It installs as a System Preferrence. I also (by trial and error) learned to leave the .local off of the Mac screename. Making the Mac the server provided for use of the Command (Apple) key. Synergy really makes life easier for me and now switching between my iMac and my Windows XP PC is as easy as it should have been all along! Full screen with a dual display setup! A workaround for another bug in the dictionary! Edge Detect effect in iMovie! A workaround for a bug in the dictionary! New feature: adding a still frame! A backup of Address Book!